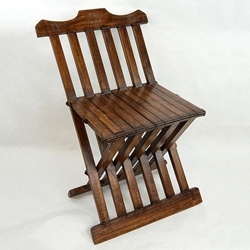 Handcrafted from wood, this medieval folding chair has hidden, internal metal pins which allow it to swivel open, or to flatten it for ease of transport and storage. The top rail is hand-etched with three mystical Seals of Solomon. This medieval chair will make a great addition to your medieval decor or medieval camp.